Apple Inc, the world’s most profitable organization when it comes to tablet and smartphones sold might be planning to bring out newer display’s for its iPad and iPhone series. The Wall Street Journal (WSJ) has reported that Apple might be experimenting with newer 12 inch iPads and 5 inch phablet sized iPhones. The source of the news seems to be right from the manufacturing factories in China where Apple has most of its devices and its equipment manufactured. The latest edition of the iPad will be going into production this month, sporting the iOS 7 with lighter and slimmer displays as compared to previous versions. However, the probability of it sporting the 12 inch screen seems to be very low since, many such designs have been experimented with previously also without any products being released. If however, such a iPad is released it could be in line with Apple’s emphasis on making leaner and more aesthetic devices for educational and reading purposes. But the fact, that such ideas are being circulated at Apple highlight its current situation where Samsung and other Tablet manufacturers are threatening to further wipe out its already low share from the tablet sales. On Tuesday, it released its financials for the quarter April-June at $35.6 bn with a profit of $6.9 bn. Of this, iPads accounted for 14.6 million devices sold worldwide. Lower than the 31.2 million iPhones sold but considerably higher than the 3.8 million Mac devices. With the exception of the iPad Mini which was only a line extension of the iPad, no new products have been launched by Apple since 2010 and with share prices down to $420 from $700 in September last year and a slew of problems in the form of the recent Tax fraud scandal, Apple is increasingly finding itself in a tight spot to maintain its profits. 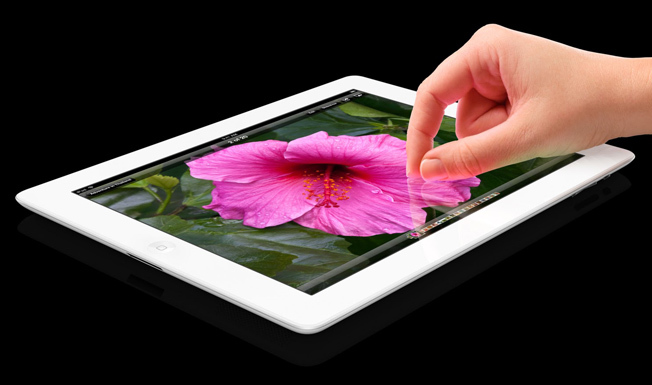 The new iPad will be available by October end and should give a much needed boost to Apple’s flagging sales. Maybe its time, Apple really brought out a 12 inch tablet or a 5 inch iPhone to challenge Samsung or bring out a completely new product along the lines of the Google Glass.